As folks who read here regularly know, I’m a numbers guy. I got a Math degree WAY back in 1979 [I think we each had to buy an abacus] and planned on teaching Math [and coaching baseball and volleyball] before making a right angle turn into law school. I have always enjoyed looking at the statistical side of things. For the past 20+ years I’ve looked pretty hard a cycling statistics, and crash statistics, in Ohio and throughout the US. 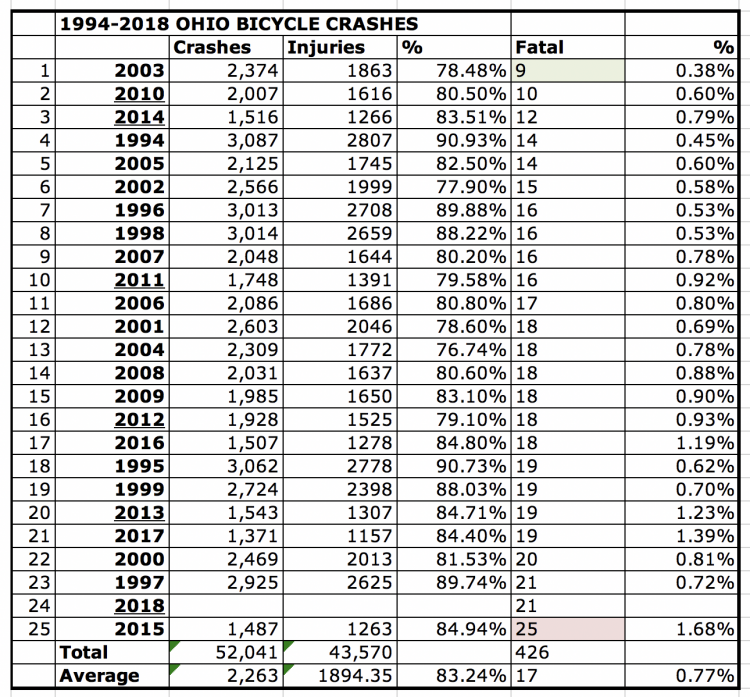 I’ve also reviewed the stats historically, and taken Deep Dive into every fatal bike crash in Ohio in recent years. 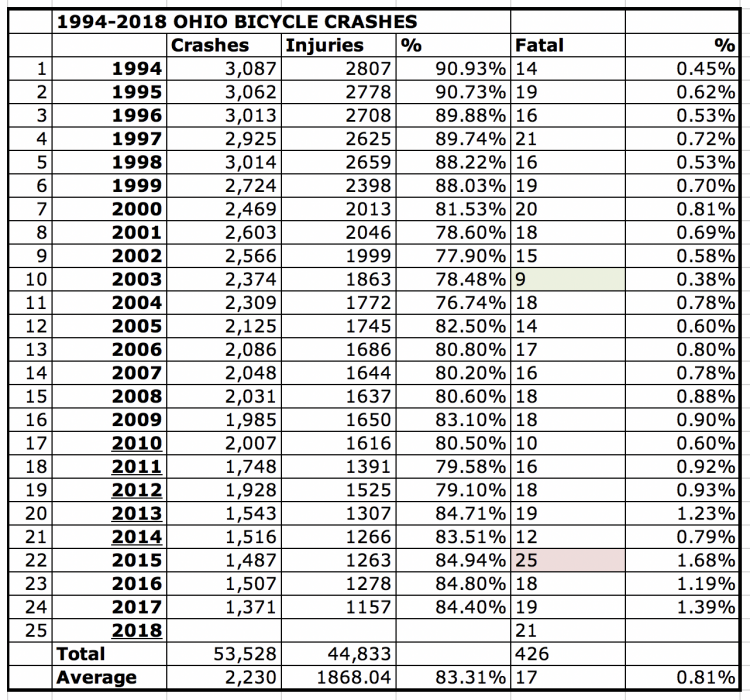 Unfortunately, the early 2018 statistics indicate that Ohio cyclists had a pretty lousy year on the roads. What’s the reason for the recent uptick? Is it even an “uptick” or are the numbers so small here that we can’t really draw any conclusions from a change of a couple either way? When your sample is 17 or so and the numbers vary from 9 to 25… and the events are…sort of random.. you’ve got to wonder what slight ups and downs mean. The average is 17 cycling deaths in Ohio now, and the median is 18. The last 4 years certainly look like a bit of an “uptick” in cycling deaths – 25-18-19-21. Is this related to an uptick in bikes on the road – a byproduct of the recent Bike Boom? An uptick in distracted driving? An uptick in dumb motorist/bicyclist behavior? An uptick in “infrastructure” or other bike “facilities” that often seem to put cyclists in a lousy position? An uptick in speeding [or a downturn in speeding enforcement]? An uptick in drugged up driving? 2018 started great in Ohio. We had ZERO cyclists killed on the roads in January, February, March and April. We then had 3 fatalities in May in relatively rural areas – Marion, Holmes and Miami counties. In June there were 5 fatal crashes, 2 in one county: Montgomery County/Dayton, Fairfield County/Lancaster, Brown County, Fairfield County, and Butler County/Middletown. In July there were only two fatal crashes – in Lucas County/Toledo and Union County. In August we had 4 fatal crashes – Stark County, Sandusky County, Logan County, Lucas County/Toledo. There were 5 cyclists killed in September- a 2nd fatality in Stark County, Lorain County, a 3rd cyclist killed in Lucas County/Toledo, Summit County/Boston Heights and Warren County/Mason. The last 2 fatalities occurred in October- Hamilton County/Cincinnati and the 2nd fatal crash in Lorain County. 2018 was unusual in a number of ways. First, the location of the fatal crashes was unusual. 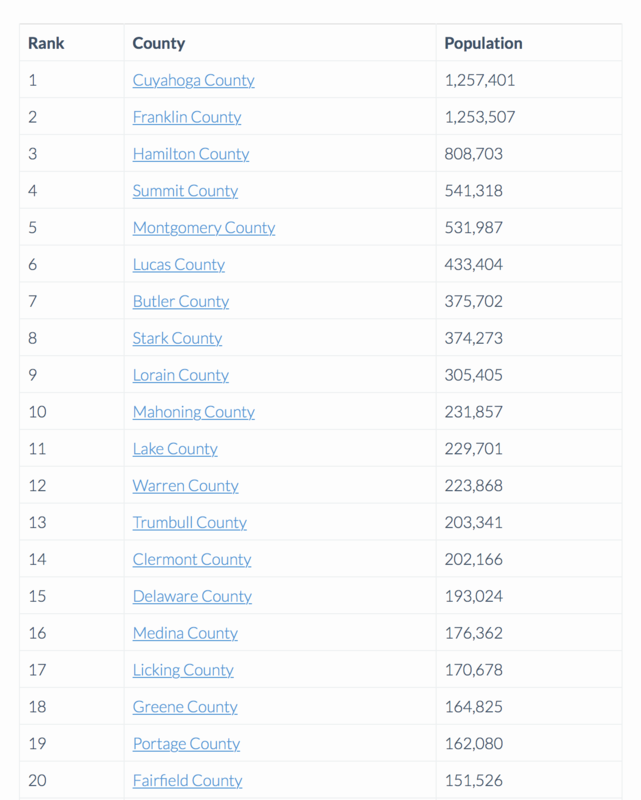 Ohio’s biggest counties, by population, are shown below. 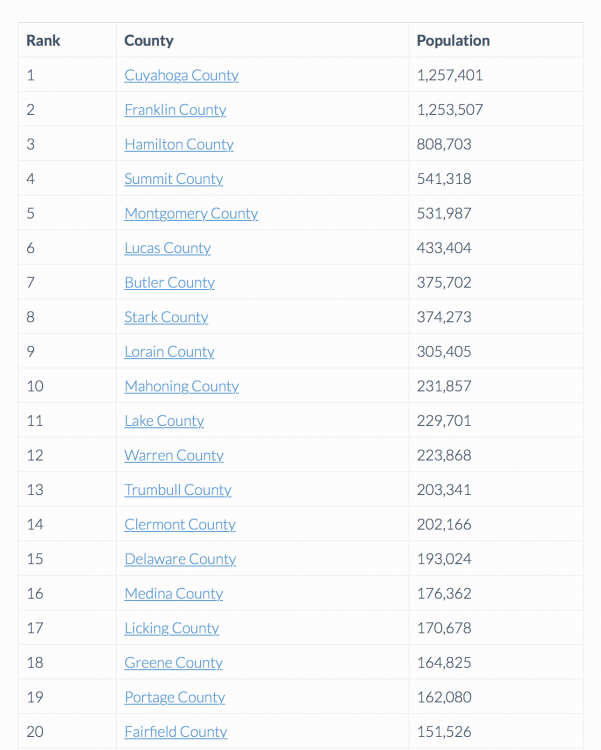 Ohio has 88 counties – 28 of which have a population exceeding 100,000 – 13 have a population over 200,000 and 5 have a population exceeding half a million people. Cuyahoga/Cleveland, Franklin/Columbus and Hamilton/Cincinnati are Ohio’s 3 largest population centers and the total population of just those 3 counties makes up almost 29% of the entire population of the State of Ohio. Franklin County/Columbus has, in recent years, become Ohio’s largest cycling area, although Cleveland may certainly challenge that claim. Franklin County is a large, flat county with a lot of nice riding roads and a big student population. Cycling in the urban areas of Columbus has really blossomed as have bike trails, bike infrastructure experiments and bicycle advocacy! We’ve also seen a large number of fatal bike crashes in Franklin County in recent years – usually more than 1 per year and FOUR a couple years ago. Yet, in 2018, Franklin County reported NO fatal bike crashes for the first time in several years. There were also NO reported fatal bike crashes in Cleveland/Cuyahoga County. Hamilton County/Cincinnati reported a single cycling fatality. 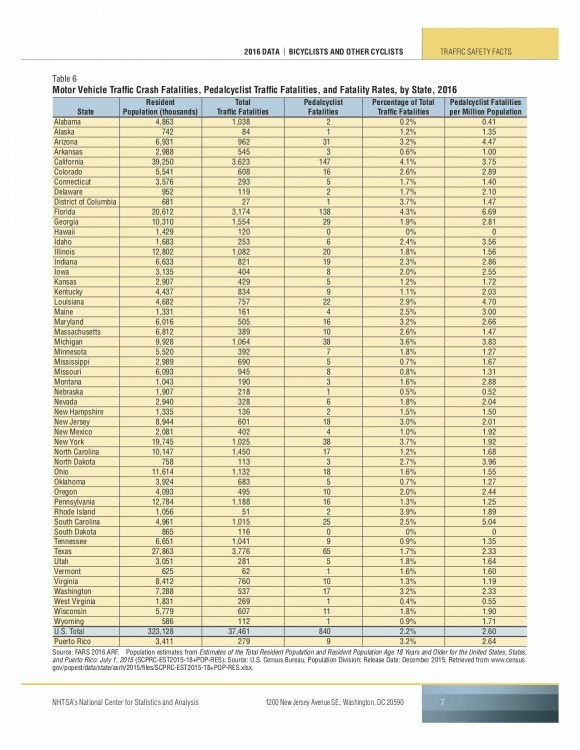 So Ohio’s three largest population centers, representing 3.3 million people and 29% of the state’s population only had ONE cycling fatality in 2018… That’s an AMAZING number. This is a reflection, I think, of the strong advocacy efforts shown by groups like Bike Cleveland, YAY Bikes in Columbus and the Cincinnati Cycle Club & Queen City Bike in Cincinnati to raise awareness and advocate effectively for safety and safe roads. This is also a reflection, I suspect, of the fact that Ohio’s less urban roadways can be real race tracks… high speeds with little speed enforcement or incentive to slow down. One thing we know for certain. Keeping cars away from bicyclists is important. People who don’t ride [or don’t look at the numbers like I do] are often surprised by the stats. When people tell me how “dangerous” cycling on the road is I ask them to guess at how many people die each year while riding on the road – how many are in crashes. The numbers are always WAY high. Bike/car crashes remain RARE in Ohio. We usually have 300,000+ car crashes involving over 500,000 people but only 1500 or so car/bike crashes. We typically see 1000+ people killed on our roads in Ohio each year but average around 17 cyclists killed. Compared to other “big” states, our “rate” of fatal crashes is very low- well below the national average. The NHTSA data from 2016 is the most recent we have from them. As you can see, the National average for the “rate” of fatal bike crashes per million population is 2.6. Ohio’s rate was 1.55 for 2016. Florida is always the worst state… by far… for crashes, injuries and death. Their rate in 2016 was 6.69. California was 3.75. Ohio was well below many bigger, and smaller, states. As we always do, we are ordering the FULL crash report for EVERY fatal bike crash in Ohio. This includes the full report, not just the 3-4 page summary you can download, along with all the photos, witness statements, measurements, crash reconstruction data, tox screens, autopsy report, photos, videos, cruiser/body cam video, “total station” data and more. We will look at all of this in our Deed Dive into Ohio’s fatal bike crashes and provide our thoughts on what’s going on and why… we’ll also try to track any criminal cases arising out of these crashes. One such case is resolving. In my next post I will talk about Greg Kostelnik’s guilty plea to a charge of Vehicular Manslaughter in Boston Heights, Ohio which arose out of the “Sun In My Eyes” crash in which he slammed into a cyclist, 58 year old Greg Kostelnik, from behind at 7:45 am on a beautiful sunny Sunday morning in September. Stay Safe- Ride LEGAL – Have FUN! CYCLING CRASHES & FATALITIES – The Numbers – Going DOWN or UP? « A CONSTITUTIONAL BIKE CASE?